Fady Y Hijji, Ankur S Narain, Kelly H Yom, Krishna T Kudaravalli, Kern Singh M.D. Background: Minimally invasive (MIS) lumbar fusion is a frequently utilized treatment for lumbar degenerative pathology. Interbody cages have been the preferred fusion construct in these procedures due to their ability to facilitate fusion and provide structural stability. However, due to the anatomic small access corridor of minimally invasive lumbar fusion procedures, the interbody cages used in these techniques are often limited in size, increasing the risk for pseudarthrosis and subsidence. Expandable interbody cages have been developed to overcome these risks in limitations. However, few clinical studies have been developed and initiated to describe the fusion rates, clinical outcomes, and complication rates in patients receiving these expandable cages. Methods/Design: A prospective case series of 30 patients receiving the FLXFit expandable interbody cage device is currently underway. Patients to undergo MIS transforaminal lumbar interbody fusion (TLIF) for degenerative pathology will be recruited based on their meeting of inclusion criteria and eligibility to receive the expandable cage device. Patient follow-up will occur at 6 weeks, 3 months, 6 months, 1 year, and 2 years. The primary outcome will be fusion status at 1-year, as measured by computed tomography (CT) scan. Patient reported outcomes and radiographic measurements will be obtained preoperatively and at all postoperative time points. All complications, reoperations, and hospital readmissions occurring during follow up will also be recorded. Discussion: This protocol is designed to better describe the outcomes and complications following the utilization of the FLXFit expandable interbody cage device following MIS TLIF. The present manuscript provides the process for patient selection, intervention, and follow-up. Trial registration: ClinicalTrials.gov identifier NCT02805985; registered on June 15, 2016. Ethics: The study protocol has been approved by the Rush University Institutional Review Board (IRB), and will be performed under the ethical standards of the IRB. Informed consent: Signed informed consent will be obtained from each patient. Lumbar degenerative disease encompasses a spectrum of debilitating and costly pathologic conditions (Cailliet, 1975). As the U.S. population ages, the prevalence of spinal degenerative conditions will continue to rise, consequently increasing the demand for surgical treatment (Cailliet, 1975; Gray et al., 2006). Lumbar fusion procedures have become a widely accepted method for the management of these conditions (Foley et al., 2003; Wong et al., 2015). Interbody spinal constructs are frequently utilized for lumbar fusion procedures in order to provide structural stability and to attain high fusion rates (Mummaneni et al., 2004). The interbody cages utilized in anterior (ALIF) and lateral (LLIF) lumbar interbody fusions are considered the gold-standard for interbody implants (Cappuccino et al., 2010; Ahmadian et al., 2013; Mobbs et al., 2013; Phillips et al., 2013; Turner et al., 2015). ALIF and LLIF techniques allow for the ability to directly access the intervertebral disc, facilitate end plate preparation, and provide room for the insertion of interbody cages with large footprints (Cappuccino et al., 2010; Laws et al., 2012; Mobbs et al., 2013; Fogel et al., 2014). Minimally invasive transforaminal lumbar interbody fusion (MIS TLIF) techniques have also gained popularity due to the feasibility for direct decompression as well as the associated benefits of decreased blood loss, decreased length of stay, and decreased risk for injury to vital structures as compared to traditional techniques (Wong et al., 2015). However, a problem commonly encountered with posterior approach procedures is the inability to utilize large interbody implants due to the constrained access corridor (Cannestra et al., 2016). Consequently, the cages utilized in MIS TLIF procedures often have smaller footprints with limited ability to provide height and lordosis restoration (Cannestra et al., 2016). The smaller footprints of MIS TLIF cages have previously been associated with subsidence, instability, and an increased risk of pseudarthrosis (Oxland et al., 2003; Lowe et al., 2004; Tan et al., 2005). Despite this, by selecting appropriate interbody implants, maintaining anatomical structures, and providing supplemental internal fixation, fusion rates and surgical success can be optimized. Expanding interbody cages have been developed to overcome the disadvantages associated with posterior lumbar fusion techniques (Cannestra et al., 2016). These cages are inserted in a collapsed configuration to permit passage through the narrow corridor, but then expanded in situ to provide anatomic restoration. Recently, expandable cages have also been designed to expand in the medial-lateral (M-L) plane in order to increase surface area contact with vertebral endplates. The FLXFit 3D (Expanding Orthopaedics, Inc., Akiva Industrial Park, Israel) is an FDA-approved expandable interbody cage that provides for both M-L and cranial-caudal (C-C) expansion. However, there remains limited data regarding the clinical benefit of these devices (Cannestra et al., 2016; Kim et al., 2016). In this context, our research team has begun a prospective case series to describe the clinical outcomes and complications associated with the FLXFit 3D device. This is a prospective post-market clinical follow-up case series study that will occur over a 24-month period ([Figure 1]). The research group will enroll 30 patients to receive the FLXFit 3D expandable interbody cage during MIS TLIF procedures. Patients will be selected based on their meeting of inclusion requirements and indications to receive the implant. The baseline assessment as well as the 6-week, 12-week, 6-month, 1-year, and 2-year postoperative assessments will be performed during follow-up visits by one of two U.S. board-certified attending spine surgeons conducting this study. Note: MIS TLIF: minimallyinvasive transforaminallumbar interbody fusion; VAS: Visual Analog Scale; ODI: Oswestry Disability Index; SF-12: Short Form-12; CT: computed tomography. All screening, baseline, and follow-up assessments will be performed at the Midwest Orthopaedics at Rush University, USA during the patient's visit with their spine surgeon. The protocol (Additional file 1 [Additional file 1]) and informed consent documents (Additional file 2 [Additional file 2]) for the present study have been approved by the Rush University Institutional Review Board (IRB) and the study sponsor. Any changes to the study protocol or consent form will be provided to the IRB and only upon approval will they be implemented. The principle investigator, research coordinators, and/or study staff are responsible for the disclosure of the study methods, objective, measurements, and risks and benefits to the participating patient, the study sponsor, university, and medical community. Written consent is obtained by the patient during their initial clinic visit following screening for inclusion criteria. Patients are given the freedom to withdraw from the study for any reason at any time. Termination may occur if the patient misses any preoperative or postoperative survey or follow-up visit. Termination may also occur if the treating physician deems it unsafe for the patient to continue in the study. Patients presenting for their first visit with one of two attending spine surgeons at an urban academic facility will be evaluated for possible surgical indications. Upon meeting criteria for surgery for degenerative disc disease or spondylolisthesis, patients will be assessed for meeting inclusion criteria of the study. Upon successfully meeting the inclusion criteria and consenting, patients will receive a set of full length standing anteroposterior (AP) and lateral radiographs of the spine. They will also complete preoperative Short-Form 12 (SF-12), Visual Analog Scale (VAS) back and VAS leg, and Oswestry Disability Index (ODI) surveys (Ware et al., 1996; Vianin, 2008; Hawker et al., 2011). These surveys have been designed and validated to accurately depict a patient's physical health, mental health, pain level, disability, and perceptions about their health before and after surgery. The patient's age, gender, body mass index (BMI), race, insurance status, smoking status, and comorbidity status as depicted by Charlson Comorbidity Index will be recorded preoperatively. Patients receiving the FLXFit 3D expandable cage will undergo a standard MIS TLIF on the date of their scheduled surgery. The surgery will consist of the patient being placed in supine position following anesthesia induction and endotracheal intubation. All patients will then receive a single-level MIS TLIF at the pathological vertebral level using a 21-mm nonexpendable tube. A subtotal discectomy will then be performed, and the FLXFit 3D interbody cage will be packed with local bone graft, demineralized bone matrix, and bone morphogenetic protein (BMP-2). The cage will then be placed into the prepared intervertebral space and expanded. Supplemental pedicle screw fixation will then be utilized. Standard uniplanar fluoroscopic technique will be used throughout the procedure to confirm accurate positioning and cage placement. Intraoperatively, operative time and estimated blood loss will be recorded. Additionally, any intraoperative complications will be noted, including but not limited to iatrogenic nerve root injury, injury to vital structures, hemorrhage, transfusion requirement, and incidental durotomy. Following the surgery, all perioperative factors and outcomes will be recorded. This includes hospital length of stay, postoperative pain as demonstrated by average daily VAS scores, and daily narcotic and non-narcotic pain medication consumption. Postoperative complications such as postoperative nausea and vomiting, venous thromboembolic events, respiratory depression/airway compromise, pneumonia, myocardial infarction, renal insufficiency, wound complications, intractable leg pain or paralysis, and admission to the ICU will be noted. Following the surgery and inpatient stay, patients will be followed with the attending spine surgeon in the clinic at 6 weeks, 12 weeks, 6 months, 1 year, and 2 years postoperatively ([Table 1]). For each of these visits, patients will be asked to complete the same surveys that were completed prior to the surgery. These surveys will be provided online to the patients prior to the follow-up visit. If not completed, patients will be asked to complete the survey in the clinic prior to seeing the physician. During the clinic visits, patients will be assessed for improvements in their pain and symptomology through neurological examinations. Any developing postoperative complications including wound infections, recurring or worsening pain, or onset of new symptoms will be reported. At each postoperative visit, standing full-length AP and lateral radiographs of the spine will be obtained. The radiographs at each visit will be assessed for cage placement, subsidence, and migration. Bony bridging and progression of intervertebral fusion will also be documented. Radiographic measurements will also be obtained for each lateral radiograph to assess for lumbar lordosis. These measurements will include global lumbar lordosis (LL) and segmental lordosis at the level treated with the FLXFit interbody device. Patients will also receive acomputed tomography (CT) scan at the 1-year postoperative visit. The CT scan will be utilized to thoroughly assess for cage subsidence and intervertebral fusion status. Cage subsidence will be defined as compromise of either the super or inferior vertebral end plate with sinking of the device into the vertebral body. Fusion will be defined as the presence of trabecular bony bridging in-between vertebral bodies in the coronal and sagittal planes, with no evidence of cystic lucencies at the margins of the implant. Improvements in VAS back/VAS leg pain scores at all time points. VAS is a 10-point measurement tool to assess pain. It allows for the measurement of this subjective trait over a continuum of values (Hawker et al., 2011). The scale ranges from 0 (no pain) to 10 (very severe pain). The patient can place a marker at any position along the scale to indicate the pain they are experiencing at the time of the survey. This measurement is obtained for both back pain and leg pain resulting from radiculopathy. Improvements in ODI at all time points. ODI is a 10-question survey utilized to measure patient disability (Vianin, 2008). Each question is scored out of 5 points, with higher scores signifying greater disability. Scores between 0-20 imply minimal disability, 21-40 imply moderate disability, 41-60 imply severe disability, 61-80 imply crippling pain, and 81-100 implies that a patient is bed-bound or exaggerating symptoms. Improvements in SF-12 scores at all time points. SF-12 is a 12-question survey utilized to measure a patient's perception of their general health and its effect on their lifestyle (Ware et al., 1996). The score is weighted to create a physical and mental component score that can depict functional status and health-related quality of life. Data will be recorded from electronic medical records and the survey studies previously described. Information will be imported into a secure electronic database by trained staff. As stated above, patient identifiable information (name, Medical Record Number (MRN), date of birth) will be utilized to collect data on the correct patient. The accuracy of the information will be verified when each patient presents for follow up. Variables collected will be as listed in the study design. After all data has been collected patients will be assigned a study serial number in the database and de-identified. All information regarding the nature of the proposed investigation provided to the investigator (with the exception of information required by law or regulations to be disclosed to the IRB, the subject, or the appropriate regulatory authority) will be kept in confidence by the investigator. All personal information will be treated as strictly confidential and not made publicly available. The sample size was determined based on the funding that was allotted by the sponsoring party. The appropriate statistical analysis will be performed for each study derived from this data set using Stata/MP® 13.1 for Mac (StataCorp LP, College Station, TX, USA). In general, demographic and baseline variables will be presented using descriptive statistics including but not limited to percentiles, percentages, means with standard deviations, medians with interquartile ranges and proportions. Normally distributed variables will be described as means ± standard deviations (SD). Non-normally distributed variables will be described as medians and interquartile ranges. Linear regression will be utilized to compare preoperative patient reported outcomes to postoperative outcomes at each follow up time point. Expandable interbody devices have been developed to overcome the disadvantages of MIS posterior approach procedures, including small cages with limited footprints (Cannestra et al., 2016). The FLXFit 3D device has been designed to expand in the M-L and C-C direction following placement to increase the surface area in contact with the vertebral end plates (Cannestra et al., 2016). These attributes are theorized to facilitate fusion while minimizing the rates of subsidence. However, the clinical outcomes following the utilization of this particular device have not been described. As such, the current study has been initiated to better assess the improvements in patient reported outcomes and fusion rates following MIS TLIF when utilizing the FLXFit 3D expandable interbody cage. Despite the theorized benefits, only one study previously analyzed the biomechanical outcomes associated with lumbar fusions utilizing M-L expandable interbody cages (Cannestra et al., 2016), they utilized 6 cadaveric specimens to assess flexion-extension, lateral bending, and axial rotation of a lumbar spine following placement of a M-L TLIF expandable cage, as compared to traditional polyetheretherketone (PEEK) TLIF cages and PEEK ALIF cages. Cannestra et al. (2016) demonstrated that the lumbar spines receiving the expandable cage with bilateral pedicle screws exhibited the highest rigidity in lateral bending compared to the other constructs with bilateral pedicle screws. Additionally, the conventional cage with unilateral pedicle screws was the least rigid of all 3 constructs. The more rigid constructs are theorized to provide the best characteristics for fusion under anterior column loading due to adequate cage size. To the best of our knowledge, no previous clinical trials have been described investigating the postoperative outcomes and fusion rates following MIS TLIF using M-L interbody cages. However, Kim et al. 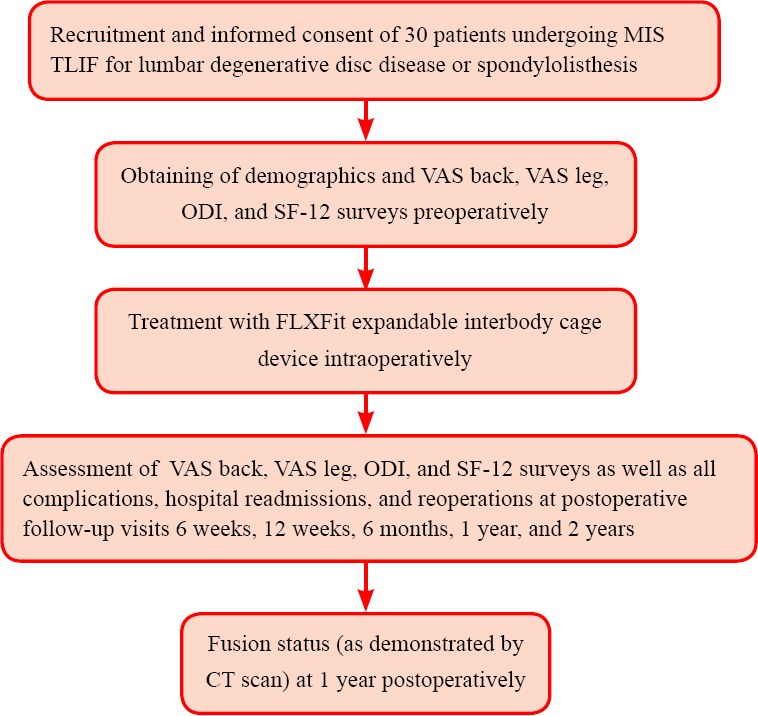 (2016) analyzed the 2-year outcomes of 50 patients undergoing MIS TLIF with C-C expandable cages, and noted significant improvement in patient reported outcomes as well as increases in intervertebral disc height at all time points following MIS TLIF with the expandable cage. Additionally, radiographic evidence demonstrated high fusion rates with no occurrence of cage migration, subsidence, or collapse in any patient. The present study aims to expand the current literature regarding expandable interbody cages in the setting of minimally invasive spine procedures. The study is currently enrolling patients at the time of submission. Ahmadian A, Verma S, Mundis GM, Jr., Oskouian RJ, Jr., Smith DA, Uribe JS (2013) Minimally invasive lateral retroperitoneal transpsoas interbody fusion for L4-5 spondylolisthesis: clinical outcomes. Journal of neurosurgery Spine 19:314-320. Cailliet R (1975) Lumbar discogenic disease: why the elderly are more vulnerable. Geriatrics 30:73-76. Cannestra AF, Peterson MD, Parker SR, Roush TF, Bundy JV, Turner AW (2016) MIS expandable interbody spacers: a literature review and biomechanical comparison of an expandable MIS TLIF with conventional TLIF and ALIF. Spine 41 Suppl 8:S44-49. Cappuccino A, Cornwall GB, Turner AW, Fogel GR, Duong HT, Kim KD, Brodke DS (2010) Biomechanical analysis and review of lateral lumbar fusion constructs. Spine 35:S361-367. Fogel GR, Turner AW, Dooley ZA, Cornwall GB (2014) Biomechanical stability of lateral interbody implants and supplemental fixation in a cadaveric degenerative spondylolisthesis model. Spine 39:E1138-1146. Foley KT, Holly LT, Schwender JD (2003) Minimally invasive lumbar fusion. Spine 28:S26-35. Gray DT, Deyo RA, Kreuter W, Mirza SK, Heagerty PJ, Comstock BA, Chan L (2006) Population-based trends in volumes and rates of ambulatory lumbar spine surgery. Spine 31:1957-1963; discussion 1964. Hawker GA, Mian S, Kendzerska T, French M (2011) Measures of adult pain: Visual Analog Scale for Pain (VAS Pain), Numeric Rating Scale for Pain (NRS Pain), McGill Pain Questionnaire (MPQ), Short-Form McGill Pain Questionnaire (SF-MPQ), Chronic Pain Grade Scale (CPGS), Short Form-36 Bodily Pain Scale (SF-36 BPS), and Measure of Intermittent and Constant Osteoarthritis Pain (ICOAP). Arthritis Care Res (Hoboken) 63 Suppl 11:S240-252. Kim CW, Doerr TM, Luna IY, Joshua G, Shen SR, Fu X, Wu AM (2016) Minimally invasive transforaminal lumbar interbody fusion using expandable technology: a clinical and radiographic analysis of 50 patients. World Neurosurg 90:228-235. Laws CJ, Coughlin DG, Lotz JC, Serhan HA, Hu SS (2012) Direct lateral approach to lumbar fusion is a biomechanically equivalent alternative to the anterior approach: an in vitro study. Spine 37:819-825. Lowe TG, Hashim S, Wilson LA, O′Brien MF, Smith DA, Diekmann MJ, Trommeter J (2004) A biomechanical study of regional endplate strength and cage morphology as it relates to structural interbody support. Spine 29:2389-2394. Mobbs RJ, Loganathan A, Yeung V, Rao PJ (2013) Indications for anterior lumbar interbody fusion. Orthop Surg 5:153-163. Mummaneni PV, Haid RW, Rodts GE (2004) Lumbar interbody fusion: state-of-the-art technical advances. Invited submission from the Joint Section Meeting on Disorders of the Spine and Peripheral Nerves, March 2004. J Neurosurg Spine 1:24-30. Oxland TR, Grant JP, Dvorak MF, Fisher CG (2003) Effects of endplate removal on the structural properties of the lower lumbar vertebral bodies. Spine 28:771-777. Phillips FM, Isaacs RE, Rodgers WB, Khajavi K, Tohmeh AG, Deviren V, Peterson MD, Hyde J, Kurd M (2013) Adult degenerative scoliosis treated with XLIF: clinical and radiographical results of a prospective multicenter study with 24-month follow-up. Spine 38:1853-1861. Tan JS, Bailey CS, Dvorak MF, Fisher CG, Oxland TR (2005) Interbody device shape and size are important to strengthen the vertebra-implant interface. Spine 30:638-644. Turner JD, Akbarnia BA, Eastlack RK, Bagheri R, Nguyen S, Pimenta L, Marco R, Deviren V, Uribe J, Mundis GM, Jr. (2015) Radiographic outcomes of anterior column realignment for adult sagittal plane deformity: a multicenter analysis. Eur Spine J 24 Suppl 3:427-432. Vianin M (2008) Psychometric properties and clinical usefulness of the Oswestry Disability Index. J Chiropr Med 7:161-163. Ware J, Jr., Kosinski M, Keller SD (1996) A 12-Item Short-Form Health Survey: construction of scales and preliminary tests of reliability and validity. Med Care 34:220-233. Wong AP, Smith ZA, Nixon AT, Lawton CD, Dahdaleh NS, Wong RH, Auffinger B, Lam S, Song JK, Liu JC, Koski TR, Fessler RG (2015) Intraoperative and perioperative complications in minimally invasive transforaminal lumbar interbody fusion: a review of 513 patients. J Neurosurg Spine 22:487-495. The study protocol was funded by Expanding Orthopaedics, Inc.
FYH and ASN wrote the manuscript, edited the manuscript, designed protocol; KHY and KTK collected the data and performed participant recruitment; KS edited the manuscript, obtained funding, provides supervision and material support, and performs participant recruitment as well as trial conduction. All authors approved the final version of the paper.